1. The first paragraph is not only the news angle, but outlines the key visual attractions at the event. 2. Each of the following paragraphs follow the same formula. 3. The critical event information is clearly detailed in an easy-to-find and easy-to-read format. 4. The media alert also notes who will be available for an interview at the event. 5. Send your information to the Chief-of-Staff or News Director as early as you can so that they can put it in their ‘diary’ – you can then ring the station on the day or so prior to the event to check if you’re on the list. 6. Hold the event in the morning so that it gives each of the TV stations time to return to their offices and prepare the story for that evening’s news. (You’ll notice we held this event at 10.30am for this very reason). So now you’re wondering if I got the media along to this event – in a word… yes! – each of the TV stations came to cover it. 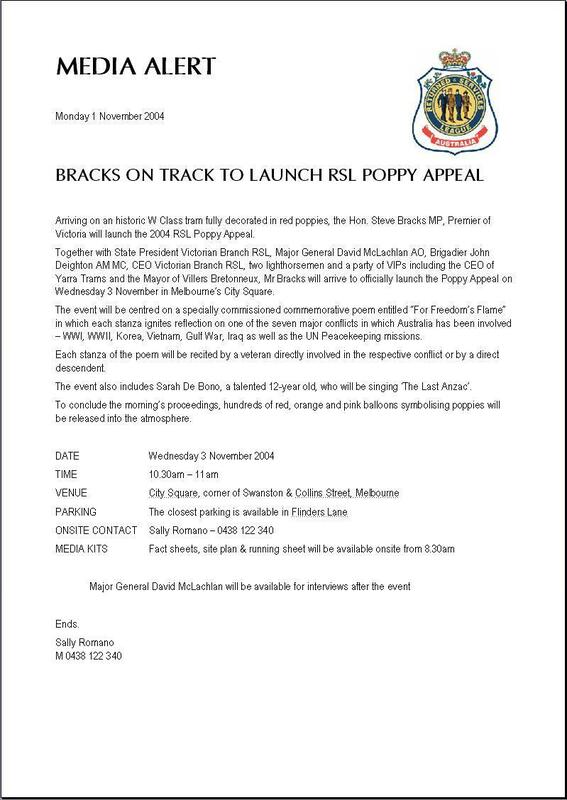 Admittedly I had some big names to drop in this media alert on behalf of the RSL but don’t be too daunted if that’s not possible (although it certainly helps!!) – if you can offer something that’s unusual or emotive with the three magic keys (movement, interest & colour – let’s call this the ‘MIC’ factor) then it’s worth consideration as the rewards can be outstanding. TV Publicity – The Golden Rule! Well, over the next few entries, I’m going to give you some great TV publicity tips. The Golden Rule in getting TV publicity is to first think about your visuals – you have to be able to offer some colour, movement and interest – these are three of the very basic requirements to get your story on TV. If you haven’t got these, you’re in diabolical TV publicity trouble! Your story is more attractive to TV when you can provide some great viewing for the audience – even if you have a fantastic story, TVs’ interest will wane in a nanosecond if they can’t get good footage or a good interview to tape. In the next post, I’ll show you how to incorporate this info into a news release. PQ Your roles at Australian Anthill are both Publisher & Editor-in-Chief – what do each of these roles involve? James Publisher is running the business day-to-day and managing the four revenue streams: advertising, retail sales, subscription sales and custom publishing (which is producing magazines for third-parties). Each segment involves different marketing skills. For example, advertising is about building one-on-one relationships through a sales team. Selling retail requires an understanding of merchandising and distribution channels. Subscriptions requires an understanding of direct mail and data management. Custom publhisng is about client management and production. I also look after the general management of the business – essentially, as Publisher, I run the business as MD or CEO. As Editor-in-Chief I provide overriding direction at the beginning and end of each edition – I can bring content in line with marketing, online and annual activities such as our Cool Company Awards. I also oversee the development of our longer-term editorial calendar and play a very hands-on role with respect to design, particularly the development of visual motifs and final sign-off. But, once again, I rely heavily on a manager, who is more hands-on – that is Paul Ryan. PQ As Editor, what role does Paul Ryan play? 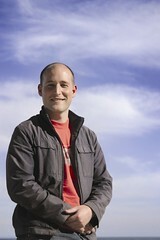 James Paul looks after the editorial content of the magazine on a day-to-day basis. He has a very strong say in what goes in the magazine and what angles we run. He understands the ‘personality’ of Anthill intuitively because he’s helped create it. The Anthill personality and editorial style was founded in the early editions, but Paul has added extra dimensions to it and today the style is more a composite of our combined attitudes (and senses of humour). He pulls together freelance contributors, photographers, illustrators and facilitates our relationship with other participants such as designers. He sub-edits vast amounts of copy to make sure it reflects the Anthill style and he writes features. He’s a very gifted journalist and treats his art very seriously. In many ways, he’s the conscience of the magazine, making sure that editorial is always compelling and of a high standard. It’s a very compatible relationship. I’m more likely to throw in something absurd and Paul is an excellent sounding board. Sometimes these absurd ideas take root and can turn into great editorial, such as the Cool Company Awards and other times Paul provides me with a sensible does of reality. PQ What’s the editorial charter for Australian Anthill? James We don’t have a formal editorial charter. In the early days I was very flexible about content and today we’re still evolving – so it would be counter productive to restrict ourselves. The magazine will always be about business growth and it will always focus on Australian companies. We will continue to cover issues of relevance to SMEs and middle-market companies. Occasionally , we also cover small publicly listed companies and innovative spin-offs from large Australian public companies. PQ What’s the decision making process about what editorial makes it to the magazine? James Anthill is structured according to sections: INSIDE, BULL-ANTS, Q&A, TUNNEL TALK etc. We have two big meetings each year where we brainstorm who and what we would like to cover in each section over the next 12 months (6 issues). Then we create a rough calendar to ensure that each edition is not too heavily weighted in one area – although occasionally we decide to theme an edition. Then before each edition, we have another meeting to determine whether our original decisions are still relevant and whether we have the resources to pursue a given topic at a given time. For example, a feature can be postponed because the subject goes missing or the topic gets covered elsewhere (and we’ll look like also-rans if we head in that direction). Ultimately, it’s a juggling match between pre-established stories and new topical items. Of course there are sections of the mgaazine that specifically relate to new deals, events, announcements, but we treat these sections with a certain level of expected serendipity – if we hear of something and it’s interesting, it goes in. (The PR pipeline keeps us well fed). PQ What are your 3 top tips you’d give to a business owner that wants to send you a media kit? James 1. You are not ‘unique’ but you might have a point of difference – emphasise that or .. present an opinion that will make me sit up. 2. Don’t use high tech language or corporate jargon – if we can’t understand it in 15 minutes, we’ll bin it. 3. Pitch to the ‘personality’ of the medium. Read the magazine first. Identify sections where your ‘story’ might fit in. PQ What kills an editorial submission for you? James Overselling a lack lustre story, technology or angle really annoys most journalists. Tone it down. For example… “We may not have discovered a cure for cancer, but we think what we have is kinda neat”. PQ What’s the best way to approach Australian Anthill with a story? Email, or call and say “G’day”. Send your info to Paul Ryan, the Editor. His phone number is 03 9428 3777. Make sure your photos are at least 300 dpi. And send your info one to two months before release date. PQ Any other pearls of wisdom? James Remember that everyone loves a story. Present your case as a ‘tale’ and preferably humorously – you’ll get a better result. PQ James, you’re a treasure and thank you soooo much for spending the time with us and being so generous with your information and insights about Australian Anthill. Well, now that you know all about Australian Anthill and you’ve heard directly from the Publisher and Editor-in-Chief no less, it’s time that you go out and buy yourself a copy, or better still, subscribe. Become familiar with the magazine (you’ll learn heaps in the process) and see if you can start getting some publicity in one of Australia’s most exciting titles. (And make sure you keep me posted on your progress too – I’d love to hear!). PS. Sorry for this post being so long – but there was so much good stuff it was impossible to make it a shorty!